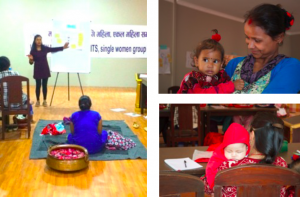 O ur vision statement: The Bindi Guide aims to help NGOs and grassroots groups co-create self-sustaining programs to empower low income women. 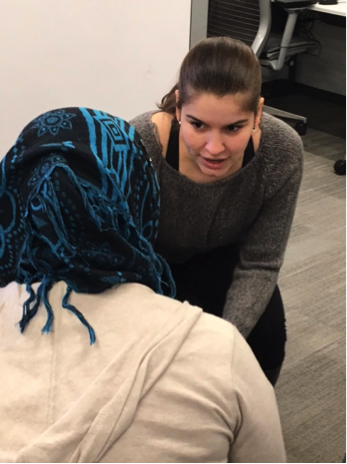 It provides them with a step-by-step process on how to design and facilitate such programs using a human-centered design and train-the-trainer approach. In March 2014 the NYU DFA studio participated in IDEO.org’s Amplify challenge on safety and empowerment for women and girls via the OpenIDEO platform. In July 2014 – after a series of online contributions, feedback, and review cycles – OpenIDEO announced they would fund our idea, which would be piloted in Nepal through Women for Human Rights (WHR), a Nepali NGO dedicated to empowering women. 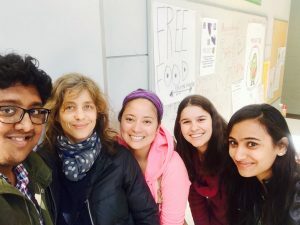 It was through the OpenIDEO platform that NYU DFA connected with the Nepali NGO, which is a testimony to the power of online collaboration. 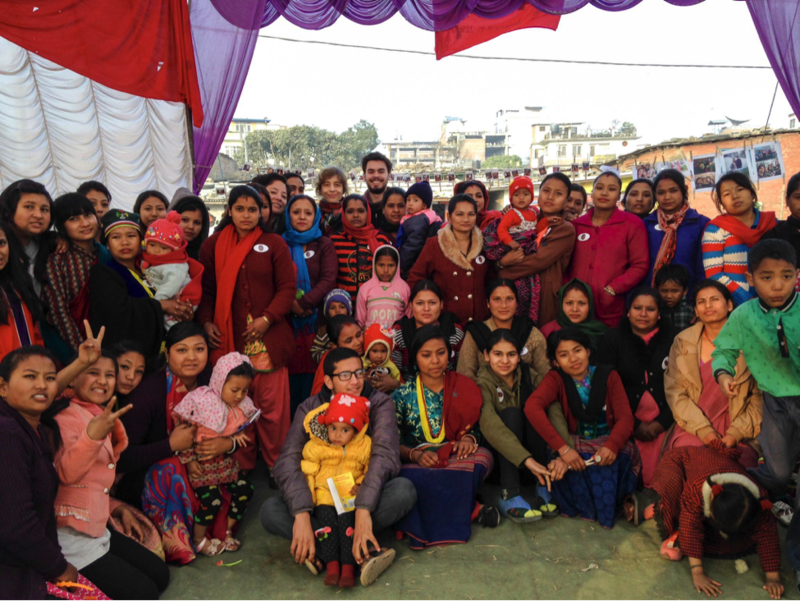 DFA NYU team meets with the Tripureshwar sahayogi saathis and Youth Club of Tripurehwar in Kathmandu, Nepal (January 2016). In July 2014 – after a series of online contributions, feedback, and review cycles– OpenIDEO announced the three winning ideas selected for funding, among them was the DFA NYU idea. 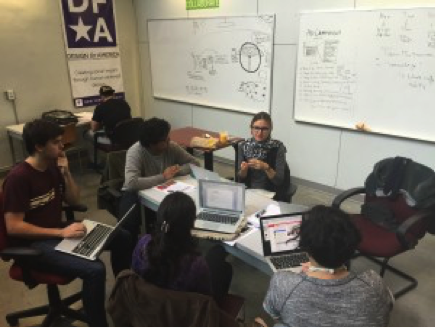 The DFA NYU proposed idea is based on the understanding that access to knowledge is power. The Bindi project, or Sahayogi Saathi as the program is called in Nepal, is a sustainable “train-the-trainee” program that empowers women –through education and access to information on health, administrative tasks, etc.– in low income neighborhoods to take on a new leadership role within their communities and can become point-persons for information sharing. 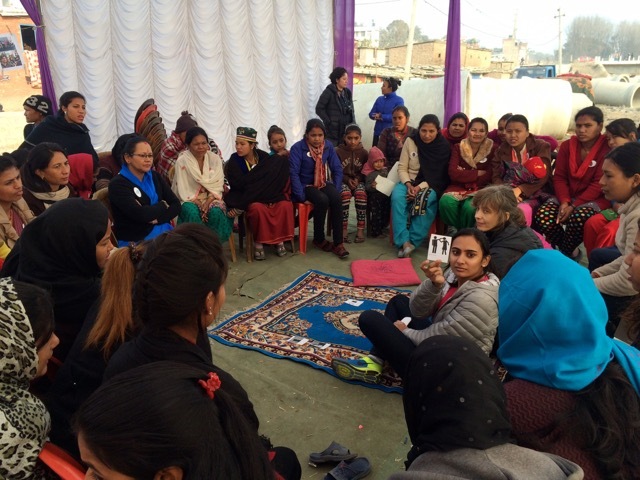 WHR is currently piloting the program with a group of women that live within a slum in Tripureshwor, near Kathmandu. 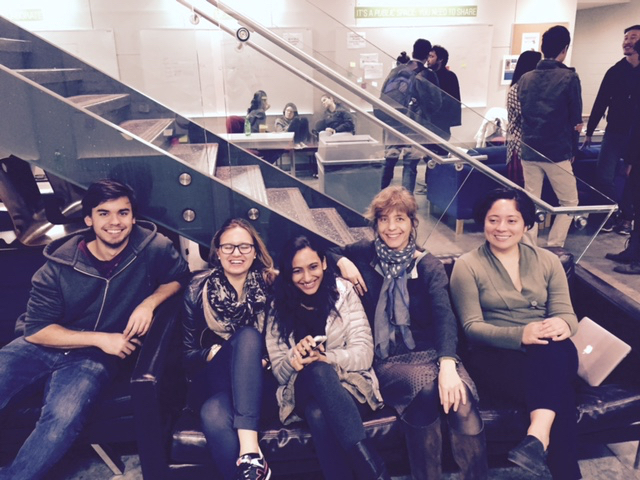 Bi-weekly team meetings at the Greenhouse Innovation Space at NYU Tandon. 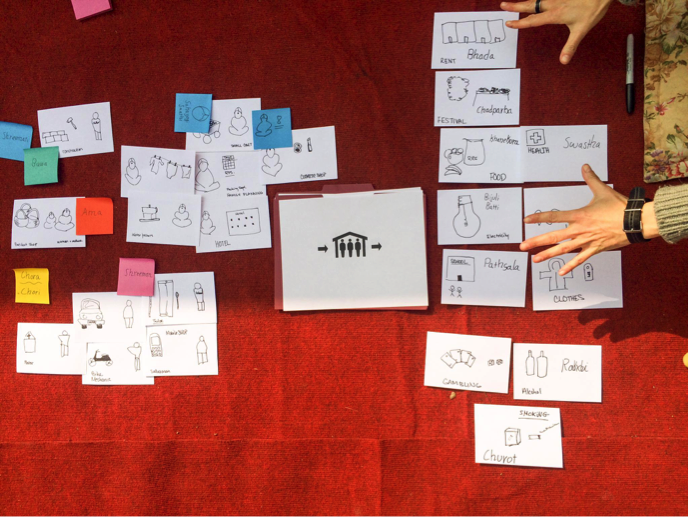 In January 2016, a group of DFA NYU students traveled to Kathmandu, Nepal in January 2016 to conduct design research and light prototyping with WHR. The research trip was supported by IDEO.org’s Amplify program, which is funded by the UKAID (the UK Department for International Development) and is part of a series of challenges that uses the human-centered design approach to find solutions for some of the world’s most pressing development issues. The pilot has started with the “bindis” in Tripureshwor. 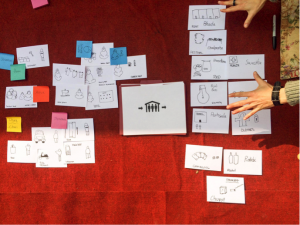 The first workshops were held in October (by WHR and Bhaktapur Youth Club, another of our partners on the ground, that we had also met on the OpenIDEO platform) and November (by WHR). First Sexual Health workshop with the sahayogi saathis of Tripureshwar; facilitated by Bhaktapur Youth Club. During our 10 days in the field, four of us (Rajni, Leslie, Noah and Anne-Laure) had the opportunity to spend time understanding WHR work and projects and most importantly to facilitate several research and prototyping workshops (using various Human-centered design tools such as card sorting, revenue flow, experience journey) with the sahayogi saathis of Tripureshwar. 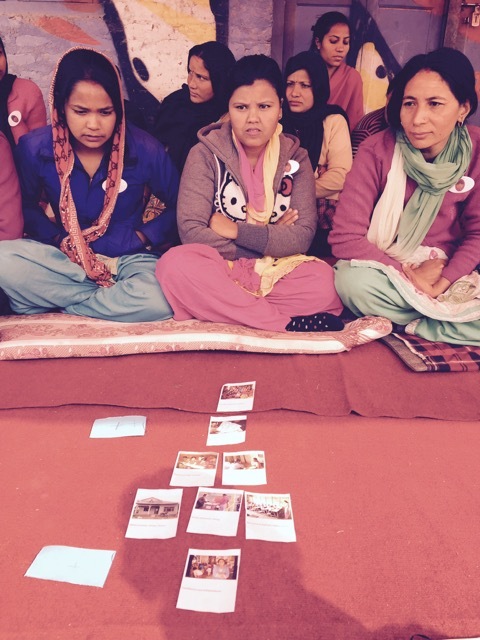 Card sorting sessions with sahayogi saathis in Tripureshwar (January 2016). This research and prototyping trip allowed us to test and validate our assumptions and further develop our idea – both the program and the associated guide. Revenue flow session with sahayogi saathis in Tripureshwar (January 2016). After our visit, we have kept working closely with WHR and the Bhaktapur Youth Club to refine the pilot. In March, as a follow up to a session with us, a group of sahayogi saathis went to a research trip to explore an opportunity for income generation (i.e. making and selling traditional wedding shoes): they went to visit various local stores and markets to understand better the customers’ habits and costs and benefits. While this seemed like a viable opportunity, some realized through this trip that they would prefer do something else and that as one explained, “now I realize I can do something else. I can be creative.” The group interested in the wedding shoes is still exploring this opportunity. 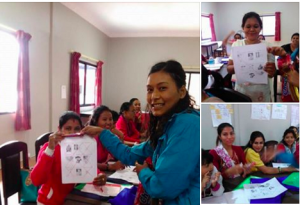 Moreover, the Bhaktapur Youth Club facilitated a second series of sexual health workshops in April. As a consequence, in May the sahayogi saathis started facilitating workshops for other women in their community: a great example of empowerment and growing their community! 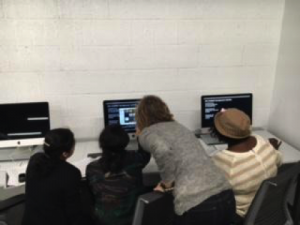 In parallel, in February 2016, we started a pilot with a NY-based NGO, Wishwas, which works with immigrant women in Queens. Our aim with this second pilot was to see how the Bindi program could be adapted and implemented in a different community and context. 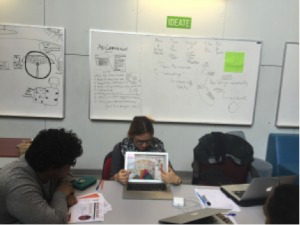 It involved six weeks of research, followed by two brainstorming and ideation sessions. One of our key learnings was that to increase its potential the Wishwas program needed to be more holistic, i.e. provide participants access to leadership, communication and business skills beyond the technical sewing skills. In order to test this assumption, our team did a light prototype of the training program. Pilot with Wishwas Participants (April – May 2016). To introduce the participants to different topics that could help them to work in a company, start their business and / or to have efficient relationships. To give them some facilitating skills that they could share their learnings with the other participants of the Wishwas sewing program. 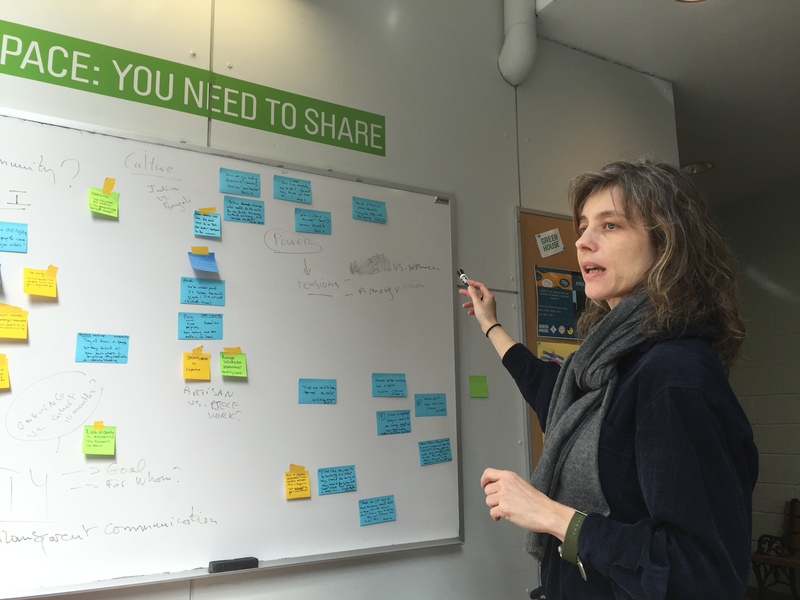 We used a train-the- trainer model combined with an experiential learning approach. We were very pleased to see the women’s interest and engagement in the pilot. They explained that these learnings would help in their future endeavors – whether to start their business, work in a company and even in their everyday life. The Queens pilot helped us refine our idea for the program and for the Bindi guide. Our learnings from both pilots – in Kathmandu and in New York – echoed each other and helped us understand better both contexts. 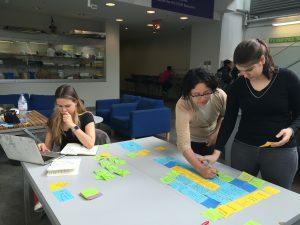 Thanks to these two pilots and the feedback of the IDEO.org team, we were able to refine our idea and focused on developing the Bindi guide, an open source guide to help NGOs implement a community-centered program to empower women.